Updates to Karen A. 's profile since your last visit are highlighted in yellow. Graduated in 1969 and went to Boston University for Fine Art..loved it!...my family then moved to California and I left Boston to join them...didn't love CA..moved back to NY and married ...we traveled by working on boats all over the Caribbean..I cooked and he crewed..(many stories there)..we were in a shipwreck... after that we got land jobs in St John... taught at a Head Start Preschool for about a year..returned to Jamestown NY...had two daughters. 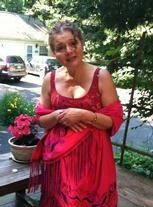 (see above)..moved to New Paltz...husband left when daughters were 2 & 4 ... I sold my batik artwork for a while in NYC and all over the country...realized that was no way to make a good living...started a greeting card business with my own batik designs...it was OK..then started a business in bath products starting with dyed loofa sponges (you can't make this stuff up! )...surprisingly it was very successful and it paid for my home & put my daughters through college and kept me out of trouble for about 17 years..Then married Terry Gavin in 1995. ..we had a son, John in 1996..... I sold out of the business to be a full time Mom..when John started school, I began to work for the arts community doing professional artist residencies in various schools...teaching batik to school children from 2nd grade through Art Ed majors at SUNY New Paltz....love helping people express themselves creatively. Both daughters are married and live close..... Erica lives next door and just had her second son on March 18! Kate is a nurse and lives 4 miles up the road. So, after a somewhat shaky start, my life turned out OK and I am now ridiculously happy! Looking forward to seing all of you! Karen A. Nochisaki Gavin added a comment on Profile. Karen A. Nochisaki Gavin updated profile. View. Karen A. Nochisaki Gavin changed "Now" picture. Karen A. Nochisaki Gavin changed profile picture. Karen A. Nochisaki Gavin has a birthday today. Hope you have a special birthday with family and friends! I still remember you as my favorite neighbor I always looked forward to seeing every school day! Karen A. Nochisaki Gavin has a birthday today. New comment added. Karen A. Nochisaki Gavin posted a message. Here's wishing you the happiest of birthdays. Happy Birthday to my favorite HS neighbor/bus stop classmate with the greatest dimpled smile, that I can admit today, I had a super crush on. Have a super day!